The Atlantic Ocean is the world's second largest ocean. It covers a total area of about 106,400,000 square kilometres (41,100,000 square miles). It covers about 20 percent of the Earth's surface. It is named after the god Atlas from Greek mythology. Its name means "Sea of Atlas." 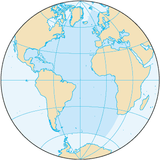 The Atlantic formed when the Americas moved west from Eurasia and Africa. This began sometime in the Cretaceous period, roughly 135 million years ago. It was part of the break-up of the supercontinent Pangaea. The east coast of South America is shaped somewhat like the west coast of Africa, and this gave a clue that continents moved over long periods of time (continental drift). The Atlantic Ocean is still growing now, because of sea-floor spreading from the mid-Atlantic Ridge, while the Pacific Ocean is said to be shrinking because the sea floor is folding under itself or subducting into the mantle. The Atlantic Ocean is bounded on the west by North and South America. It connects to the Arctic Ocean through the Denmark Strait, Greenland Sea, Norwegian Sea and Barents Sea. It connects with the Mediterranean Sea through the Strait of Gibraltar. In the southeast, the Atlantic merges into the Indian Ocean. The 20° East meridian defines its border. In the southwest, the Drake Passage connects it to the Pacific Ocean. The Panama Canal links the Atlantic and Pacific. The Atlantic Ocean is second in size to the Pacific. It occupies an area of about 106,400,000 square kilometres (41,100,000 sq mi). The volume of the Atlantic, along with its adjacent seas (the seas next to it), is 354,700,000 cubic kilometres. The average depth of the Atlantic, along with its adjacent seas, is 3,339 metres (1,826 fathoms; 10,955 ft). The greatest depth is Milwaukee Deep near Puerto Rico, where the Ocean is 8,380 metres (4,580 fathoms; 27,490 ft) deep. The main feature of the Atlantic Ocean's seabed is a large underwater mountain chain called the Mid-Atlantic Ridge. It runs from north to south under the Ocean. This is at the boundary of four tectonic plates: Eurasian, North American, South American and African. The ridge extends from Iceland in the north to about 58° south. The salinity of the surface waters of the open ocean ranges from 33–37 parts per thousand and varies with latitude and season. ↑ 1.0 1.1 1.2 "How Big is the Atlantic Ocean?". National Ocean Service. National Oceanic and Atmospheric Administration, U.S. Department of Commerce. May 15, 2014. ↑ "Seafloor Spreading". National Geographic. National Geographic Society. ↑ 4.0 4.1 4.2 4.3 "The Atlantic Ocean" (PDF). Marine Biodiversity and Ecosystem Functioning EU Network of Excellence. p. 1. Archived from [www.marbef.org/outreach/downloads/Atlantic%20ocean%20pullout.pdf the original] Check |url= value (help) (PDF) on September 1, 2012. ↑ 5.0 5.1 5.2 "Gulf Stream". Encyclopedia.com. Dictionary of American History, The Gale Group, Inc. 2003. ↑ 6.0 6.1 6.2 "The Mid-Atlantic Ridge". United Nations Educational, Scientific and Cultural Organization (UNESCO). UNESCO World Heritage Center. ↑ Talley, L.D. (2002). "Salinity Patterns in the Ocean: Volume 1, The Earth System: Physical and Chemical Dimensions of Global Environmental Change". In MacCracken, M.C. ; Perry, Dr. J.S. Encyclopedia of Global Environmental Change (PDF). John Wiley and Sons. pp. 629–640. ISBN 0-471-97796-9.